It’s not easy for me to say, but I’ve been blogging for nine years, and I’m still only moderately successful in terms of online fame. My pageviews are okay, my social media following is nothing to boast about, and my YouTube channel is a passion project that never quite took off. You might be thinking ‘why is this girl still blogging then? !’ The truth is, my blog is profitable. Yup, I make enough money from my blog and social media channels to make it worth the effort to run them. A little sidebar before we talk more about business. My blog is also a creative outlet that I love, but for the purpose of this chat, I’m talking just dollars and cents. Like most other bloggers I really wanted to make it big. I imagined getting a cookbook deal, endorsing major brands, having a line at Target (until they went bust in Canada), the whole nine yards. But that never happened for me, and the true success didn’t come until I stopped trying to be North America famous, and focussed on being hyper-local and catering to a niche. There are two things that are unique to me and my blog. First-off I live in a city called Surrey BC, where almost no one wants to admit they are from, and very few lifestyle and food bloggers boast about living. Secondly, I’m South Asian. I to ok these two factors and turned them into an opportunity to create unique partnership opportunities. I’ve collaborated with my local tourism marketing board to show “big-city” bloggers the great hole-in-the-wall restaurants in my hood, and I’ve worked with mainstream brands to create campaigns around ethnic holidays that no one was talking about, and I’ve managed to with national brands like Kraft, Lindt, and Bounty by maintaining a highly engaged audience. 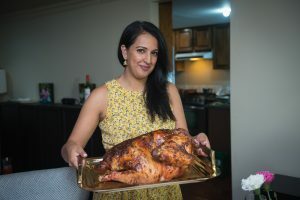 In addition to my creative collaborations, I also started a social media marketing company that specializes in working with food, travel, and hospitality businesses, and I’m a partner in a blogger’s network called South Asian Bloggers Network, which connects businesses and brands with an underserved audience. At the Food Blogger’s Conference in Juneau, I’ll be sharing my top tricks and tips for finding unique sponsorship opportunities. Maybe the biggest brands won’t work with you (yet), but we can figure what is unique to you that can be marketed – even if you aren’t a superstar! Your unique selling point doesn’t have to be as obvious as ethnicity. Are you an expert on craft beer in your region? Vegan food writer? Do you make the best darn lunchbox snacks for littles? In my session I’m going to show you my strategy for matching your “secret sauce” with a regional marketing strategy, and amplifying it by showing a brand your expertise in reaching a certain audience.